He was embroiled in a bitter row with former flame Shelby Tribble after she overheard his plans to make moves on another cast member. 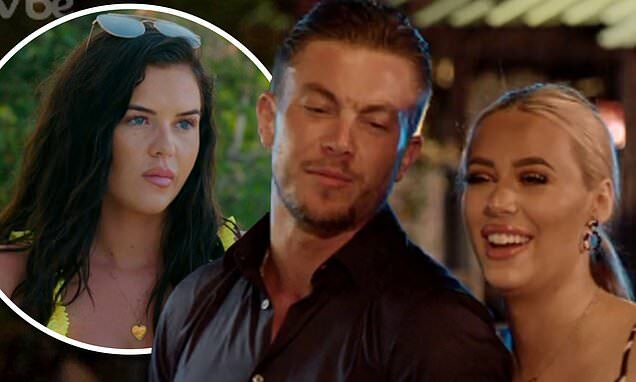 And Sam Mucklow brushed aside the drama as he continued to flirt up a storm with Demi Sims during Sunday's edition of The Only Way Is Essex. Proving things are hotting up between the pair, the former footballer, 26, and his new love interest, 22, enjoyed a casual double date with Georgia Kousoulou and Tommy Mallet, before admitting he's 'not ready' to fix his issues with Shelby, also 26. The sportsman coyly shared: 'This is a teaser', before blonde beauty Demi interjected: 'We're not officially off the dating scene yet'. Elsewhere into the episode, the pair enjoyed some alone time as they engaged in a cosy chat by a waterfall. Last week, he found himself in an explosive row with model Shelby, in which he branded her a 's**g', just one day after they slept with each other.